Eco-Friendly Reusable Glass Coffee Cup with Silicone Lid. SAVE THE PLANET - 2.5 Billion Single Use Plastic Coffee Cups are used in the UK every year. 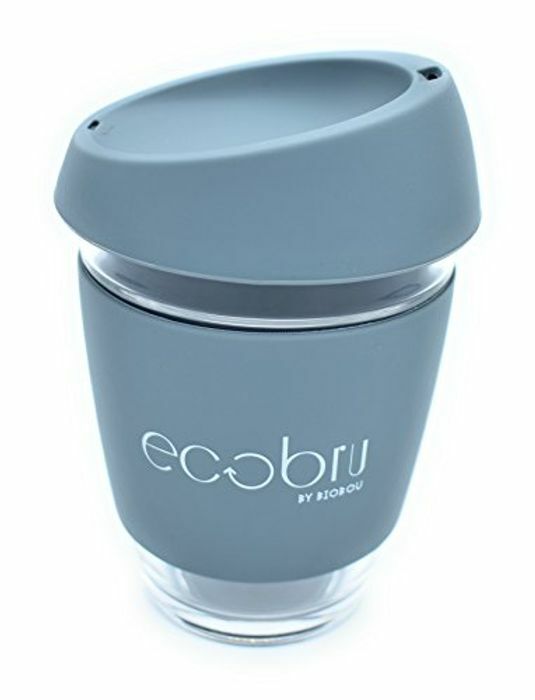 Help fight the war on plastic by using the stylish Ecobru Reusable Coffee Cup. SAVE MONEY - Discounts at many Chain/Independent Coffee Shops by using your own Stylish Reusable Coffee Cup! Or Simply make your coffee at home before you travel. OUR PREMIUM QUALITY PROMISE - Made of durable, high-quality glass and food grade silicone. If you are not 100% satisfied with the Ecobru, we will offer a full refund if returned within 30 days of purchase. Hypoallergenic, FDA Approved, BPA Free and ... Eco-Friendly! im trying really hard to cut down on my plastic use, and a reusable coffee cup is one thing I’ve been researching a lot. This is a great saving, and great for the planet- what more could you ask?